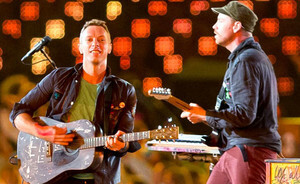 Coldplay have revealed that they are set out to take a three year break. The band were performing live at the Suncorp Stadium in Brisbane, Australia on November 21st. Even though Coldplay have not given details on the new album, they have said that it will be easier to pronounce than their latest release, Mylo Xyloto. The Maccabees have announced that they will self-produce their new studio album. The band mentioned that they felt ready to take control of recording sessions on their own. The Maccabees will be supporting The Black Keys on their European tour through December. The tour will be finishing up with two shows (December 12 and 13) at London’s O2 Arena. Skrillex and Ellie Goulding are set to release a collaborative music project in 2013. Despite their recent break-up, they are both still in good terms and will continue to work together on their new project for next year. Rihanna has equalled Madonna’s UK Album Chart record with her new album ‘Unapologetic’ entering at number one. This is her third consecutive UK number one, following her last releases of Talk That Talk and Loud. According to the Official Charts Company, it has sold almost 100,000 copies this week. Ke$ha has announced that The Strokes frontman, Julian Casablancas and drummer, Fabrizio Moretti will both be featured on her new album Warrior. The pop star’s new album is set to be released on December 3rd. Along with recruiting two member of The Strokes, she mentoined that The Black Keys’ Patrick Carney will be featured on the album. The new album will also feature a collaboration with Iggy Pop. Julian Casablancas and Fabrizio Moretti will appear on the song, ‘Only Wanna Dance With You”. Lady Antebellum have been wrapping their Christmas album, On this Winter’s Night. They had mentioned that they recorded it last year in July. The album is out and available in stores today, just in time for the season. This entry was tagged Coldplay, Ellie Goulding, Fabrizio Moretti, Julian Casablancas, Ke$ha, Lady Antebellum, Patrick Carney, Rihanna, Skrillex, The Black Keys, The Maccabees, The Strokes. Bookmark the permalink.